To fulfill the high yield 200t/d kraft paper making project, Leizhan elite engineers and experts made the following design for the customer. First, waste paper or paper pulp is conveyed to ZDSD28 D type hydrapulper by BFW1600 chain conveyor for pulping. 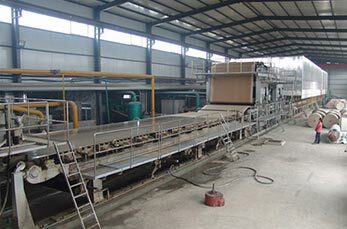 Then, the paper pulp will be transported to ZSC6 high density cleaner, to remove heavy impurities like staples, stones, glasses in the paper pulp. After that, advanced structure ZNS1.2 mid consistency pressure screen can be used to screen various impurities in the paper pulp. In addition, separators like ZDF3 Single effect fiber separator and PZ2 Reject separator can be used to relief fiber and separate impurities from pulp. Finally, claners(i.e.mid density cleaner, low density cleaner)and screens(i.e.mid consistency fine screen, 1st stage fine screen) will be used for cleaning and screening the impurities in the pulp to ensure the high quality of the paper pulp. Leizhan 200t/d kraft paper processing system has an product capacity of 200t/d of recycled fluting in the basis weight range of 80 to 200g/m2, the design speed is 450m/min.